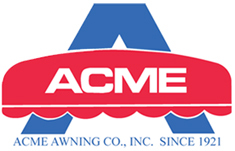 Acme Awning Co., Inc. has supplied commercial and residential customers in the New York City Tri-State Area with the highest quality fabric awnings since 1921. Trust our skilled and experienced professionals for knowledgeable sales and support, as well as expert installation. Draw attention to your business with a Custom Fabric Awning or Canopy, Cool Down your home without Air Conditioning with an Awning over your Windows and Patio. When you need a residential or commercial awning, turn to the pros. Serving customers in the Tri-State Area since 1921, our expert staff offers more than 100 years of combined experience. By constantly upgrading our technology and training our staff, we are able to keep on the cutting edge of Awning and Canopy Technology, which means you enjoy established installation technicians who are equipped with knowledge of the latest and best awning products and practices.